Rescuers are seen entering an office building that collapsed on its side from an early morning earthquake in Tainan, southern Taiwan, Saturday, Feb. 6, 2016. A 6.4-magnitude earthquake has struck southern Taiwan, according to the U.S. Geological Survey. 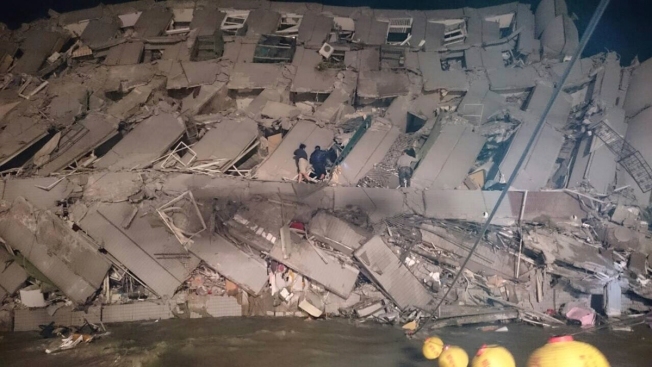 Prosecutors have requested the detention of the developers of a high-rise apartment building in southern Taiwan that collapsed over the weekend following a strong earthquake, killing dozens of people, official media said Tuesday. The Tainan District Prosecutors Office said Lin Ming-hui and two others, identified only by their surnames, Chang and Cheng, were suspected of negligence resulting in death, Taiwan's official Central News Agency reported. The office requested their detention to prevent collusion or other acts that could disrupt the investigation, CNA said. A hearing on the matter was scheduled for later Tuesday. The death toll in the quake stood at 41 on Tuesday afternoon, with all but two of the deaths coming in the building collapse. More than 100 people are believed to still be trapped in the debris. Shoddy construction is suspected as having contributed to the disaster, with the 17-story Weiguan Golden Dragon, built in 1989, the only major building to collapse in the quake. Although the shallow quake was potentially devastating, few buildings were damaged as a result of strict construction standards in force in Taiwan, an island that is frequently struck by quakes. Most of the 320 people who were rescued from the disaster were saved in the hours immediately after the quake, in which the building collapsed onto itself before toppling over onto its side. Among the survivors, Ko Ching-chung said he had propped himself against a wall to avoid falling onto his girlfriend after the quake hit just before 4 a.m. Saturday. But after 20 hours, he could no longer hold on and collapsed onto her. "She would have soon not been able to breathe," Ko, who was rescued along with his girlfriend on Sunday morning, told reporters Monday at the hospital where he was recovering. "I said to her I had to lay on top of her and she said to me it's OK."
Five survivors were believed to have been pulled out on Sunday, and at least four on Monday. One of them, Tsao Wei-ling, called out "Here I am" as rescuers dug through to find her. She was found under the body of her husband, who had shielded her from a collapsed beam, CNA reported. Tsao's husband and 2-year-old son were found dead, and five other members of the family remained unaccounted for, the news agency said. Teams on Monday also rescued a 42-year-old man and an 8-year-old girl. The girl, Lin Su-chin, was recovering in a hospital, where she told her father and grandparents that she was looking forward to gorging on sweets as soon as she was well enough. Shortly after she was rescued, workers also pulled out her aunt, a 28-year-old Vietnamese woman identified as Chen Mei-jih, who had been trapped on what was the building's fifth floor. Earthquakes rattle Taiwan frequently. Most are minor and cause little or no damage, though a magnitude-7.6 quake in central Taiwan in 1999 killed more than 2,300 people. The quake struck during the most important family holiday in the Chinese calendar — the Lunar New Year. The extended Lunar New Year holiday — the most important family holiday in the Chinese calendar — officially started Monday, but celebrations in Taiwan have been subdued.